The Physical Activity Serving Society (PASS) project, led by Sport and Citizenship and six partners, including ISCA, has now released the results of its review of physical activity research in Europe. 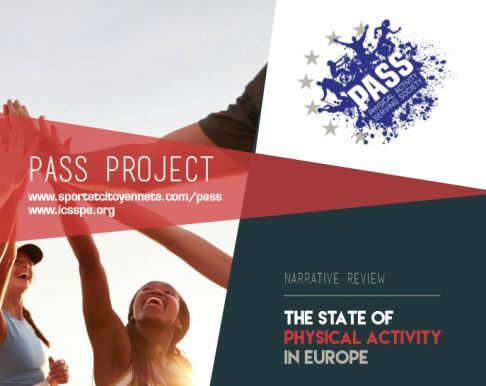 Building on reports such as Designed to Move and ISCA and Cebr’s ‘The Economic Cost of Physical Inactivity in Europe’, the PASS project’s narrative review ‘The State of Physical Activity in Europe’ and supporting infographics are now available. The review was conducted by the International Council of Sport Science and Physical Education (ICSSPE) within the framework of the Erasmus+ Sport programme. It reveals that physical activity levels are declining around Europe, with over a third of women being inactive and regular physical activity decreasing with age (from 64% of children being active regularly or some of the time to 31% of citizens aged from 40-54). The Economic Cost of Physical Inactivity’s striking finding that inactivity is costing Europe 80 billion euro per year is featured in its review of economic impact, along with particularly conditions, such as depression and obesity, that are linked to physical inactivity. The 36-month PASS project aims to offer alternative political and strategic actions relating to physical activity for 10,000 cross-sector stakeholders at the European level. The narrative review is part of the first of the three steps the project will take, and will be followed by raising awareness among decision-makers and mobilising political authorities and high profile figures in sport and physical activity to tackle the physical inactivity crisis. Download the narrative review The State of Physical Activity in Europe and use its findings to advocate for physical activity initiatives in your community.